Republican presidential candidate Donald Trump speaking during the evening session on the fourth day of the Republican National Convention at the Quicken Loans Arena in Cleveland, Ohio, July 21, 2016. 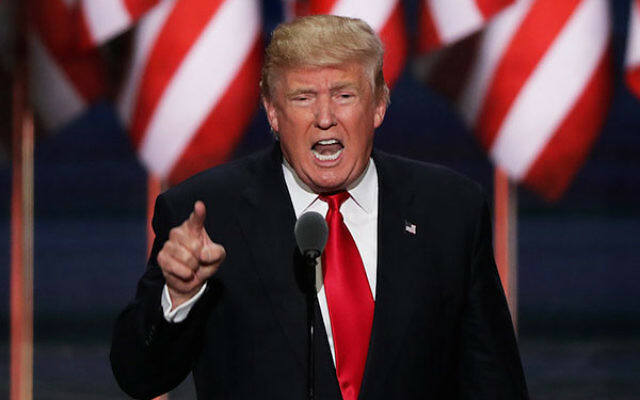 Attacking presumptive Democratic nominee Hillary Clinton’s record as secretary of state in his speech Thursday at the Republican National Convention, Trump criticized last year’s agreement curbing Iran’s nuclear program. Opposed vehemently by the Israeli government, the agreement is a popular bête noire for Republicans. Trump said the deal put Iran “on the path to nuclear weapons.” He also criticized the Obama administration for reneging on its pledge to attack Syria if its government used nuclear weapons. Trump pledged to defeat the Islamic State terror group, known as ISIS, and called Israel America’s best ally in the Middle East. Trump criticized the United States’ allies for taking advantage of its military protection and financial assistance. He called NATO “obsolete,” and said “the countries we are protecting at a massive cost to us will be asked to pay their fair share.” On the day he addressed the American Israel Public Affairs Committee in March, he had suggested that Israel would be included in that group. Trump said he would prioritize nationalism over “globalism.” He repeated his slogan, “America first,” at one point chanting it while discussing trade agreements. “America first” was the name of an isolationist and often anti-Semitic movement leading up to World War II. Trump has said the slogan has no connection to the movement. Much of the speech concerned fortifying the U.S. border and increasing law and order in the country. Trump condemned attacks on police officers, read off a list of recent negative economic trends and promised to improve the economic situation of all Americans. Calling himself the “law and order candidate,” Trump said the U.S. would “be a country of generosity and warmth,” while providing security to its citizens. Trump criticized career politicians, promising to fix what he portrayed as a broken system. He cited Vermont Sen. Bernie Sanders’ loss to Clinton in the Democratic party as an example. He said he would appeal to Sanders voters by promising to improve America’s trade agreements with other countries for the benefit of American workers. Trump pledged to ease access to private schools, saying he would allow parents to send children “to the safe school of their choice.” He also criticized the restriction on religious leaders preaching politics from the pulpit, known as the “Johnson amendment,” and said that he was “not sure I totally deserved” the support of Evangelical Christian communities. Trump was introduced by his daughter Ivanka, who is Jewish. Ivanka Trump said she did “not consider myself fundamentally Republican or Democrat.” She said Trump would change labor laws to benefit working mothers, and would push for equal pay for equal work. She also said her father had a “strong ethical compass” and recalled building toy models of buildings on his office floor as a child. Trump returned the affection, showing pride in his wife, Melania, and his five children. And though he called for unity in the country and to “believe in America,” he got in a jab at his string of opponents this year.